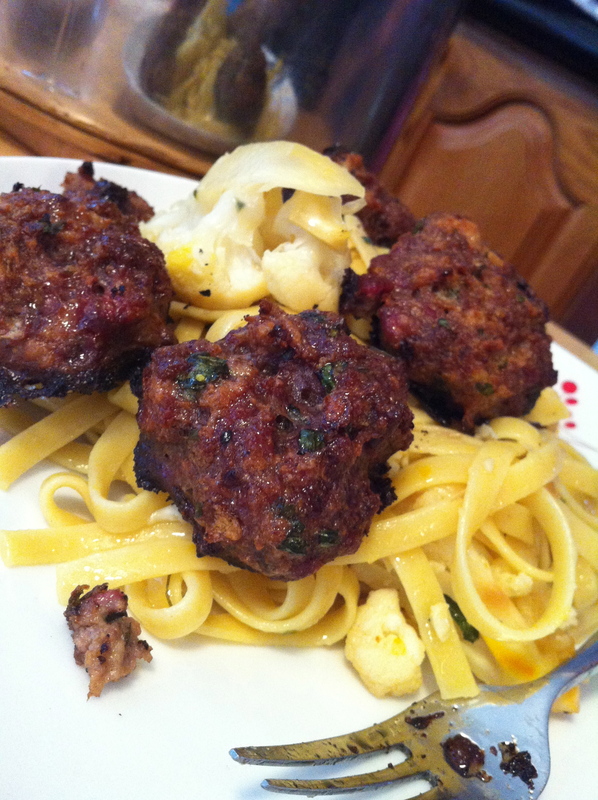 For dinner tonight we had Saffron Cauliflower with Parsley and Pasta and the MOST.AMAZING.MEATBALLS. My sister the chef would call these AMAZEBALLS. 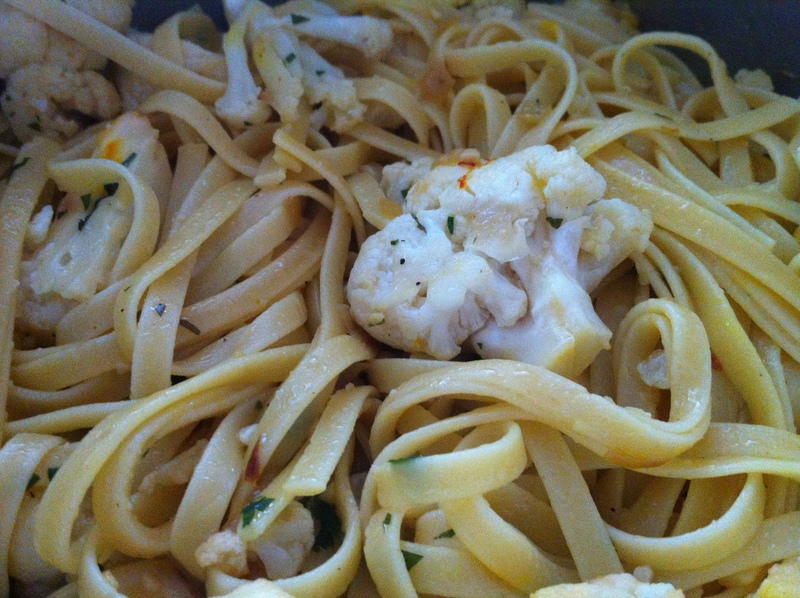 The cauliflower was steamed then tossed with the caramelized onions and saffron, then you add in the parsley and garlic, cook it a bit more, and then finally toss everything with freshly cooked pasta. Now, I got this recipe from a lady called Lynne Rosetto Kasper, a woman whose podcast I listen to every week. 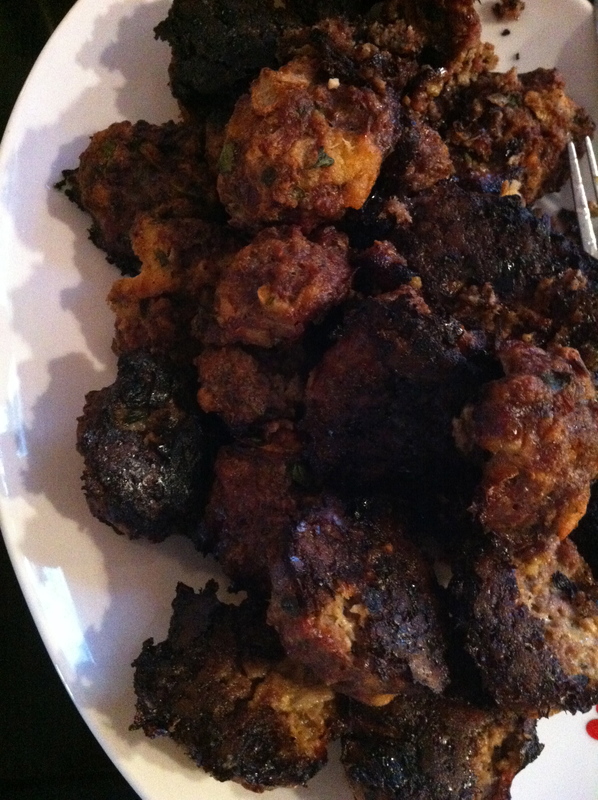 While I enjoy her radio show, this is the second of her recipes that I tried – and found BOTH pretty lousy. And I actually followed the recipe this time! No substitutions or forgetting or anything. Everyone around the table agreed that my roasted cauliflower is MUCH better – and a hell of a lot less work too. 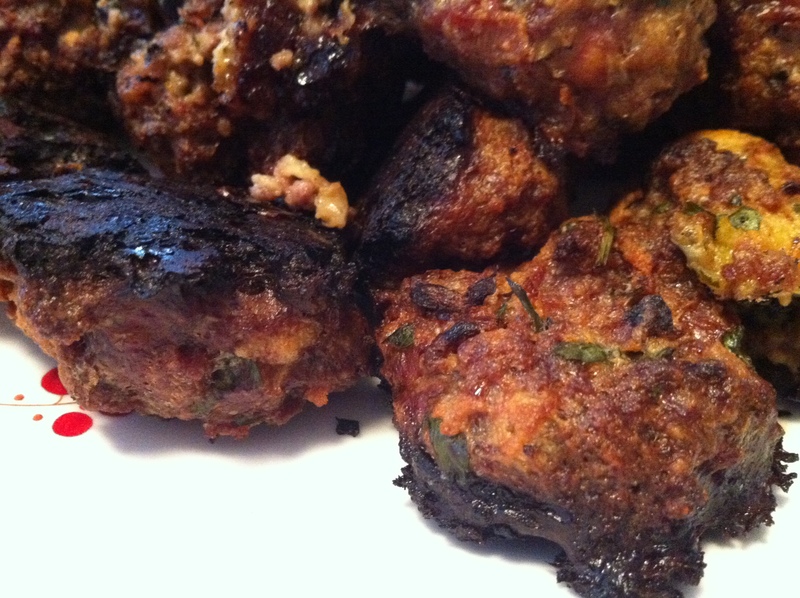 The meatballs on the other hand – SERIOUSLY freakin’ good. Crunchy on the outside and soft on the inside – sooooooo good. So So So good. My MIL looked at me said, “You know I don’t like chopped meat, right?” – she said this as she was holding out her plate for seconds. Or was it thirds? (Chopped meat for those outside of New York means Ground Beef or Hamburger Meat). Crispety outisde, delicious on the inside! 2 pinches of Saffron threads **I got mine at Trader Joe’s at a VERY reasonable price. 4 Tablespoons Parsley, finely chopped **I used 1/2 a bunch. 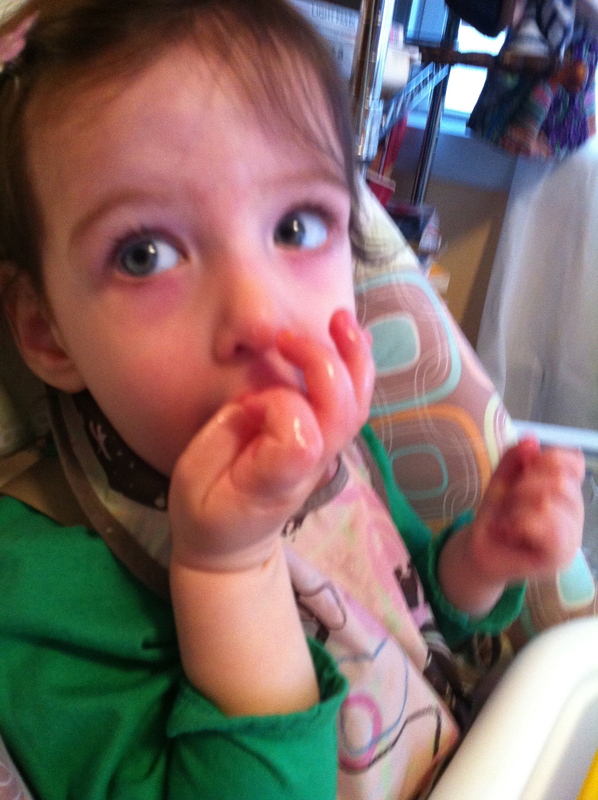 Pasta **She recommends using snail shaped, I think that’s weird and used fettuccine. 1- Steam the cauliflower over boiling water until it’s nearly cooked through, but not quite. **Or shove yours in a vented, covered dish and nuke it for 3-5 minutes, depending on your microwave. 2- Bring a large pot of salted water to boil for your pasta. Cook it until it’s done. You’ll know it’s done when it’s a little chewy but not hard to chew – that’s called Al Dente. See? You learned something. You is educated. 3- Heat the oil in a large skillet over medium heat. Add the onion and saffron and cook, stirring frequently, until the onion is soft, about 6 minutes. Add the garlic, pepper flakes and a few pinches of the parsley, give them a stir and then add in the cauliflower. Toss to coat. **My skillet was too small to coat everything well, so I needed to offload my pan to a large bowl, stir and shovel everything back to the skillet. 4- Add 1/2 cup water and continue cooking over medium heat until the cauliflower is tender. Season with salt, add in remaining parsley and keep warm until the pasta is done. 5- Drain the pasta, add in the cauliflower/saffron mix and stir. Now, you’re supposed to just gracefully drape in some oil and salt and pepper before serving, but I found this needed a HECK of a lot of oil and salt to make it taste like…well, pasta. I thought the saffron was underwhelming to say the least. I thought the cauliflower bland and the parsley a waste of chopping skills. Seriously, I’m sticking to roasted cauliflower. Roasting makes everything taste better. Backstory Part 2 – I got this recipe outta Cook’s Country’s Oct/Nov 2012 issue. I doctored it just a little bit – subbing out 2 slices of bread for a nice fresh and fluffy pita I had on hand, not including pork and using chicken broth instead of milk in the panade. Oh, and the recipe is actually for Meatballs and Marinara. GOD BLESS AMERICA’S TEST KITCHEN. They are an amazing organization. 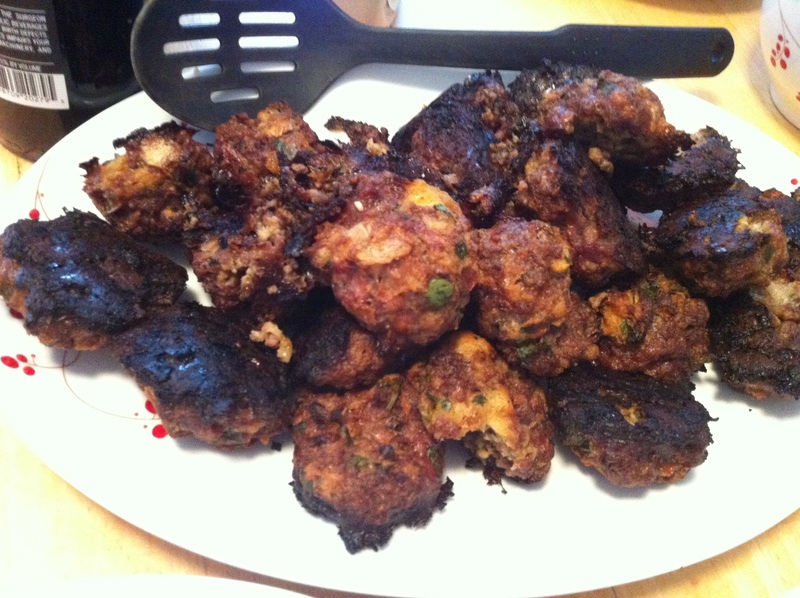 I was worried they were a little too burnt… They were A.W.E.S.O.M.E. 1 Tablespoon Dried Oregano **I forgot to add this. OOPS! 3/4 teaspoon Red Pepper Flakes **CRAAAAAAP! I forgot these too! 4 Slices hearty white Sandwich Bread **I used 2 slices Potato Bread and 1 nice fresh and fluffy pita. 3/4 cup Milk **I used No-Chicken Chicken Broth. 1/2 lb Sweet Italian Sausage, casings removed **TOTALLY skipped this. No pork in this house! 2 oz. Parmesan Cheese, grated (1 cup) **As this was a meat meal we didn’t use any dairy. Feel free to add and let me know what it was like! 1/2 cup Parsley, chopped **I used 1/2 a bunch. 1 1/2 teaspoons Salt **I used 1/2 teaspoon as we were using kosher meat which is already very salty. 2 1/2 lbs. 80% lean Ground Chuck **I used whatever Ground Beef I bought. I guess I should look for the percentages…but I don’t. 2- Heat oil in a large skillet (Cast Iron really is the best) over medium-high heat until shimmering. Add onions and cook until golden brown, 10-15 minutes. Add garlic, oregano, and pepper flakes and cook until fragrant, about 30 seconds. Or, be like me and just throw in the garlic. 3- Meanwhile, tear the bread into bits with your brute-like strength. Mash bread and milk/broth together to make a paste. Add sausage (if using), parmesan (if using), parsley, eggs, garlic, and salt, and then mash to combine. 4- Add beef and GENTLY knead with hands until combined – do not overwork! 5- Form mixture into balls – the recipe says to make 16 but those would be FREAKIN’ HUGE. I made 26 large ones and that was without the 1/2 lb. sausage. C looked at me and asked me if I’d ever been to a real Italian restaurant. They serve, like two HUGE meatballs on a plate. I still thought my meatballs were on the large side. 5b – Place your balls on a rimmed baking sheet (I lined mine with foil for easier cleanup), and bake until well browned, about 20 minutes. 6- If you’re finishing these in sauce, this is where you’ll transfer the meatballs to your pot o’ marinara and simmer them to finish the cooking, about 15 minutes. If you’re NOT serving them in sauce, and want nice crunchy meatballs, take them outta the oven, turn it off, and let them cool on the stove top for an hour or so. 7- Oven back on to 350ºF. DON’T WAIT FOR IT TO HEAT UP – whack the cooled pans back in the oven and set the timer for 20 minutes. At the 20 minutes mark, or so, they should be all crispety and delicious. Remove from the oven, pry off the foil and serve in any way your heart desires. C topped his pasta with the meatballs. Pretty! These were so good that R ate a WHOLE one all by herself!